Barack Obama and John Kerry admire and want to preserve Israel as a Jewish and democratic state in the Land of Israel. I have covered this issue my entire adult life and have never met two U.S. leaders more committed to Israel as a Jewish democracy. Bibi never lays down a credible peace plan that truly puts the ball in the Palestinians’ court. And when someone like Obama exposes that — and Bibi comes under intense criticism from the liberal half of Israel, which sees the country getting more and more isolated and less and less democratic — Bibi just calls Obama an enemy of Israel and caves to the settlers. U.S. Jewish “leaders” then parrot whatever Bibi says. Sad.More worrisome is the fact that President-elect Donald Trump — who could be a fresh change agent — is letting himself get totally manipulated by right-wing extremists, and I mean extreme. His ambassador-designate to Israel, David Friedman, has compared Jews who favor a two-state solution to Jews who collaborated with the Nazis. I’ve never heard such a vile slur from one Jew to another. One day Trump will wake up and discover that he was manipulated into becoming the co-father, with Netanyahu, of an Israel that is either no longer Jewish or no longer democratic. He will discover that he was Bibi’s chump. 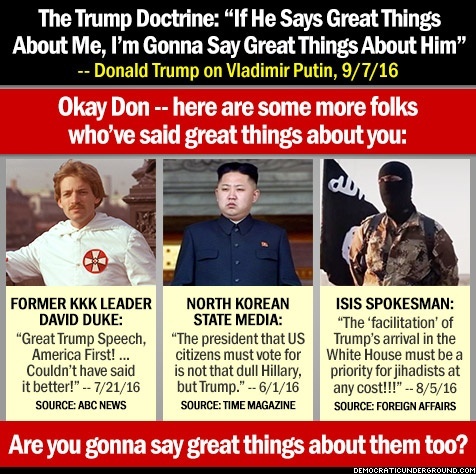 Trump is the chump of any loudmouth who heaps praise on him. The Orange One is so easily manipulated through his own vanity and need for validation. Trumputin and Bibi will start a new fire in the middle east and Putin will be able to go after Ukraine and the Baltic States and dRump will say too bad for them!